The Journey of the one-in-a-billion 1937 Bugatti Atlantic. Classics Museum unveiled the Bugatti to the public before the extensive restoration process begins. This was an exclusive viewing and a rare opportunity to view the car. During the evening Tom Andrews the museum owner gave a presentation on the history, his dream and vision for this amazing piece of automotive history. Tom successfully bid on a very rare car in an auction at the Artcurial Auction House in Paris, France February 6th. Sixty classic cars were found late 2014 after sitting in a barn in Western France for 50 years and have been auctioned off. Roger Baillon owned a successful transport company in western France and began collecting some of the most beautiful and important cars the world has ever known. For nearly two decades, he built up one of the finest collections in all of Europe, saving a great number of cars from being scraped. Until his company faltered in the 1970’s which forced him to sell over 50 of his beloved cars, but he was able to keep 60 of them. The collection of cars sat on his property in Western France, untended, in barns and garages, for fifty years. Many of the cars were unprotected from the elements; inevitably time took its toll and rotted the cars to various degrees while they slowly faded from memory. Roger Baillon died more than 10 years ago, and his son Jacques, who inherited the collection died last year. The family did not realise the classics were worth as much as they are. In late December 2014 Artcurial Auction House in France revealed the discovery they called the King Tut of barn finds; a treasure trove of 60 European cars that has been slowly decaying in the barn. Amongst the collection of cars included a rare Ferrari once sat in by Jane Fonda thought to be missing for decades and a Talbot-Lago previously owned by extravagant Egyptian King Farouk. The Baillon Collection was catalogued and initially valued around $24 million. In February this year the collection was presented to the world in what is easily the most eerily beautiful classic car auction of the year, perhaps ever. During the course of the sale the auction house set 10 world record auction prices. 100% of the lots in the Baillon collection were sold, achieving 2,4,6 and sometimes 10 times their estimates, including two world record prices. 5 cars sold were above 1 million euros. 10 cars were sold above 500,000 euros. Over 1000 people registered on Articurial livebid. Tom has purchased the Bugatti Type 57 Ventoux, a very valuable and rare car and has brought the car to New Zealand to restore and eventually display at Classics Museum, Railside Place, Hamilton. This particular Bugatti was one of only 719 ever built and was initially built with a Gangloff body which was later replaced with a Ventoux body in the 1950’s. It was not uncommon for vehicle bodies to be changed, some owners had summer and winter bodies that they swapped seasonally. For several years Tom has thought of owning a Bugatti. Tom had a friend from England travel to France and to give a report on this car and several of the other cars in the Artcurial Auction. At this point he knew that the Gangloff body had been removed and a Ventoux body was on the chassis. On inspection of the body he understood that the Ventoux body was made on 5 July 1938 was body number 86 and came off chassis no 57706. A full investigation on this car has been carried out to leave no doubt of its identity. The chassis of this car is 57579 with motor gear box and diff numbered 417 this confirms that this car originally carried the Gangloff body. The running gear 417 is a numbers matching motor, gear box, diff and chassis. We consider to be in perfect condition for restoration as it is complete and has never been pulled apart. As such we know a full excellent restoration can take place to a high standard. Now that our Bugatti has landed in New Zealand you might be wondering what is next? Our plan and focus for the next few years is to build an Atlantic body for the chassis and to fully restore the chassis. We have been asked why we are not going to restore the Ventoux body or rebuild the Gangloff. Firstly, we will restore the Ventoux body as the body is beautiful and valuable in its own right this will eventually be displayed at Classics Museum. Our first focus will be to build the Atlantic. We see the Atlantic as one of the greatest bodies made by Bugatti, it is a significant piece of history in the Bugatti story and is by far the most valuable body in the world today. The Atlantic has been described as “art on wheels”. There are only two Atlantic Type 57SC left in the world. One belonging to Ralph Lauren’s collection (worth $40 million) and the other is in the Mullin Automotive Museum in California. When these cars were produced, a Ventoux body cost 70 thousand French Francs, a Gangloff body cost 80 thousand French Francs and the Atlantic body cos 150 thousand French Francs. Whereas an average car was only about 5 thousand Francs. Upon completion this Bugatti will be the only one of its kind in New Zealand. 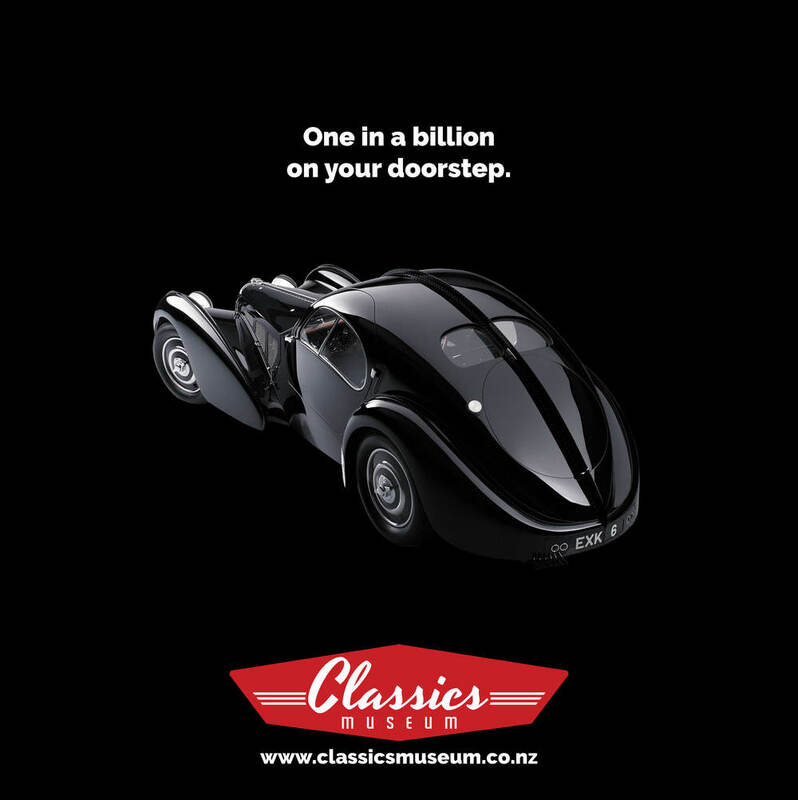 We look forward to the day when we can finally display our Bugatti Atlantic at Classics Museum as it will be a worldwide attraction at home here in Hamilton, NZ. We plan to have the Bugatti finished and on display by early 2018. Make sure you like our Facebook page to keep up to date. Thank you. We will be in touch when the one-in-a-billion car has been completed.